So, like millions before us, we headed to Graceland. For me it was like participating on the Santiago di Compostella Camino or visiting Our Lady’s Shine at Lourdes. Snatches of songs from U2 ( “… early morning April 4 shot rings out in the Memphis sky …”), Mott the Hoople (“All the way from Memphis”) and, of course, Marc Cohn ( “… Saw the ghost of Elvis on Union Avenue, followed him up to the gates of Graceland, then I watched him walk right through …”) played randomly in my mind and I had that warm tingling feeling of a homecoming. What you experience, however, is a little different as the commercial realities of operating a major visitor attraction – Graceland is the 2nd most visited private home in all of the US – kick in. I moved gingerly around Elvis’s home, bought in 1957 for over $100k when Elvis was a mere 22 years of age. It’s less extravagant that I imagined and certainly a good deal smaller. 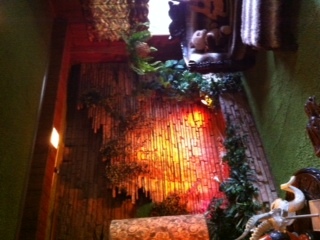 There’s a simplicity to it although I expect the decor solution in the Jungle room (referenced in “Walking in Memphis”) was way out there for its time. Outside there’s a small swimming pool, some undulating pastures and a meditation garden where you can find Elvis’s grave along with those of his grandmother (who outlived him), his parents and, poignantly, his still born twin brother. Then you board the bus and they take you over the other side of the road where there are 5 different themed exhibits to visit, each ending with its own extensive souvenir shop. The exhibits include Elvis’s car collection and his jets and a very compelling video presentation on the famous 1970s documentary made about Elvis on tour. There’s a slightly dated feel to the collection and the in-your-face commercialism does mock your naivety at expecting that it might, in fact, be otherwise. That said, I entered the Racketball court and stood transfixed, with about 50 others, as a very living Elvis performed Trilogy on a giant plasma screen. Glory, glory alleluia indeed. We arrived back at the Peabody just in time for the opening session of the annual conference of ADME, the Association of Destination Management Executives. Over 150 DMC professionals from all over the US and Canada, along with 2 mavericks from Ireland listened excitedly to the ever-elegant Susan Grey, President of ADME 2011, as she welcomed us to Memphis. We had further words of welcome from the avuncular Doug Brown, Vice President of the Peabody, who shared how he once stood in front of an all female audience, zipper unfastened. Then Kevin Kane of the Memphis CVB and current chair of the Destination Marketing Association International (DMAI) spoke about the importance of the DMC / DMO (= Destination Marketing Organisation) relationship. Kevin spoke passionately about attracting visitors to destinations and the vital importance of this for the economic fabric of a country. Apparently within the next 10 years over 10% of all employment globally will stem from travel. Access to this lucrative market is open to all destinations, big and small, and success will pivot around the brand proposition and marketing messages devised within the destination. DMCs play a seminal role in this process and must become effective destination spokespersons. Clearly the relationship between Kane’s organisation and local ADME member Destination King is golden. 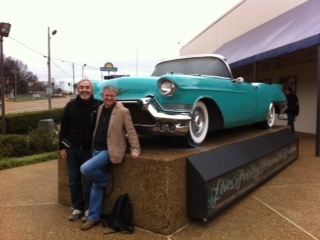 They work together as trusted partners and strive to “create memories” around the brand assets of Memphis – its heritage and history, its flawless musical pedigree and its serendipitous link to three undisputed regal icons – Martin Luther King, BB King and Elvis Presley. Kevin presides over a bureau which has taken to social media like the Peabody ducks take to water. Under his watch the CVB has hired Kerry Crawford, a smart and engaging Gen Y blogger whom they put out out there to tell the world how she loves Memphis. She blogs under her own handle and the CVB does the smart thing by staying out of the way and not censoring or sanitizing Kerry’s postings. It’s a brave and daring initiative but it’s working with individuals from all over the world joining in the conversation about Memphis.